Akira and Miki from Devilman are visiting the Getter Robo base when it happens to be attacked. But who are the attackers? The demon Silene has joined with the Dinosaur Empire! Will our heroes prevail?! For those of you who don't know, and I wouldn't blame you, this is a manga crossover between two creations of the Father of Combining Robots himself, Go Nagai. Specifically Getter Robo and Amon: Devilman. Now I know what you're thinking: Who/What is Getter/Devilman? Well, I can tell you. Both of them are creations, as I said, of Go Nagai, who created such things you may have heard of such as Mazinger Z, Steel Jeeg and Violence Jack. What possesed the man to cross over a giant robot with a man possesed by the devil is beyond me but hey, I'm not as badass as he is. Getter Robo is about a team of robot pilots fighting a Dinosaur Empire that live in the core of the Earth, using a powerfull energy from space known as Getter Rays. Now, I don't know much about Devilman at all really, but from what I can tell it's about a man named Akira who got possesed by a demon called Amon and he must now fight off Amons bride Silene who is trying to kill him, I think? I'm probably wrong but, whatever, I should read the manga. 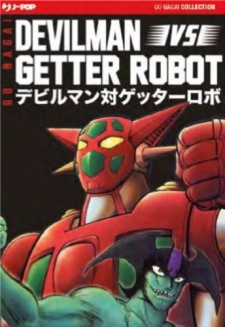 One of the things that would immediately strike Nagai fans as odd, is that the Getter team in this manga is the version from the original anime, Getter Robo, and not the original manga. How do we know this? Well, Ryoma and Hayato are much more subdued and the Command Machine is in it (Though it does lead to a rather funny scene where Professor Saotome calls the Command Machine "Useless"). I've never read or watched Devilman at the time of this review, so I can't tell you how accurate his portrayal is, but considering most of the manga revolves around him, I would assume it's ok. The plot revolves around Akira (Devilman himself) and his friend Miki visiting Saotomes lab, since apparently Miki and Michiru are friends...go figure. Of course the Getter team and Akira quickly start argueing. Meanwhile, the Dinosaur Empire is still trying to take down the Getter and Devilmans villan, Silene, approaches the Dinosaur Emperor Gore, suggesting they join forces temporarily to defeat their enemies. What follows is 4 chapters of Devilman fighting demons while Getter is actualy kind of useless most of the time. The Dinosaur Empire forces are easily taken down but Getter has some serious trouble fighting the demons, it's actualy a little disapointing in that regard. What we do get though are 2 entirely new robots that have no context outside of this short series, so if you don't want spoilers feel free to skip the rest of this paragraph. We get Getter Queen and DevilGetter! Getter Queen is apparently a prototype Saotome made before the Getter, but accidently made the cockpits too small and only women can pilot it, so obviously Michiru and Miki hop on in and start flying around, it looks alot like Aphrodai A to me. As for DevilGetter? Well, to fight the demons Devilman actualy possesses the Getter to form DevilGetter and...it's actualy extremely badass looking, makes you wish it was in more. The artwork is pretty good for the most part verging on a little strange sometimes. Whoever drew it seems to have a fixcation with drawing bare breasts and butts at every available opportunity. We see Michiru naked, we see Miki naked, we see Musashi naked for some reason. I know with Silene you can't help it but woah! A man could die from that much exposure. Normaly I wouldn't be complaining, I mean, it's me talking here, but considering how short this series is, it felt like a little too much sometimes. The mecha drawings are nice, with the new ones looking pretty awesome and needing their own series if you ask me. Imagine that huh? Amon: The Darkside of DevilGetter...what? I'd read it. So who is this for? Nagai fans? Probably, it kinda relies on you already knowing what the hell is going on beforehand although I suppose that is the staple for any crossover. If you're a Go Nagai fan, feel free to give it a try and if you're not, if you want a really, really short example of what Go Nagai works are like, give it a quick glance, just don't expect AAA+ entertainment here because you won't get it.